~ Frodo in “Sappho and Alcaeus”, by Sir Lawrence Alma-Tadema, CROPPED. Note: Some large, high-resolution images will make this entry time-consuming to open on dial-up; my apologies. Also, you will need to scroll over to center the manip on your screen, as it is quite wide. I thought I’d lift my head from reading and reviewing MEFA competition fics and post a Frodo Art Travesty I made last week. I had meant to save it for “Hobbit Month,” but, what the heck? This manip is based on a painting by 19th century Dutch-born English artist, Sir Lawrence Alma-Tadema (1836-1912), called "Sappho and Alcaeus". ~ “Sappho and Alcaeus”, aka “The Temple of Sappho”, by Sir Lawrence Alma-Tadema, 1881. In Alma-Tadema’s painting, Sappho (the famed 7th century B.C. Greek poet, from Mytilene, on the island of Lesbos) is leaning her chin on her hand, listening attentively to one of her Mytilene contemporaries, the poet Alcaeus. A wreath lays upon the lectern, ready to present, if she deems him worthy of the prize. As soon as I saw it, I thought of making it into a "Frodo Art Travesty", although Frodo’s figure would be somewhat small in it. Looking at it, my first thought was of Frodo, singing songs to a sighing gathering of fans. Bilbo would be just off to the right, accompanying him hauntingly on the syrinx (Greek pan pipes). Less AU, I thought it made a fine illustration of Frodo, in Tol Eressea, giving a command performance for his Elven hosts. A courtyard in Avallónë, high above the Sea, might very well look like Alma-Tadema’s view of the Aegean, as seen from this terrace in Mytilene, also located on the western edge of an island. Frodo Baggins, already a highly-appreciated singer of tavern songs, might feasibly have spent some of his long years in the Undying Lands learning to play a musical instrument. Why not the lyre? He then could accompany himself while he sang or recited poems about his native land across the Sundering Sea; melancholy, and full of love. I am sure he would be invited to perform for them. Often. Note: For a gorgeous, huge, full-sized, high-resolution image (too large for an LJ page), click HERE. Set in the open air, with a view of a halcyon sea, the painting shows the main characters of a goddess temple in the roles imagined by Alma-Tadema's Victorian contemporaries. On the left is Sappho, the High Priestess. By her side stands a girl representing the White Goddess as Spring, who is costumed as described by earlier English poets such as Spenser (The Faerie Queen) and Marlowe (Hero and Leander). Before them is a laurel wreath, which, if Sappho so decides, will be presented to the young musician. The wreath is no simple accolade - its granting means that the player is inspired by the muses and is a true musician and that he has a place in the temple while ordinary men have not. The laurel is also a promise of immortality. This relationship, of an applicant poet/musician and a recognising high priestess is one referred to and re-enacted by many including Robert Graves. 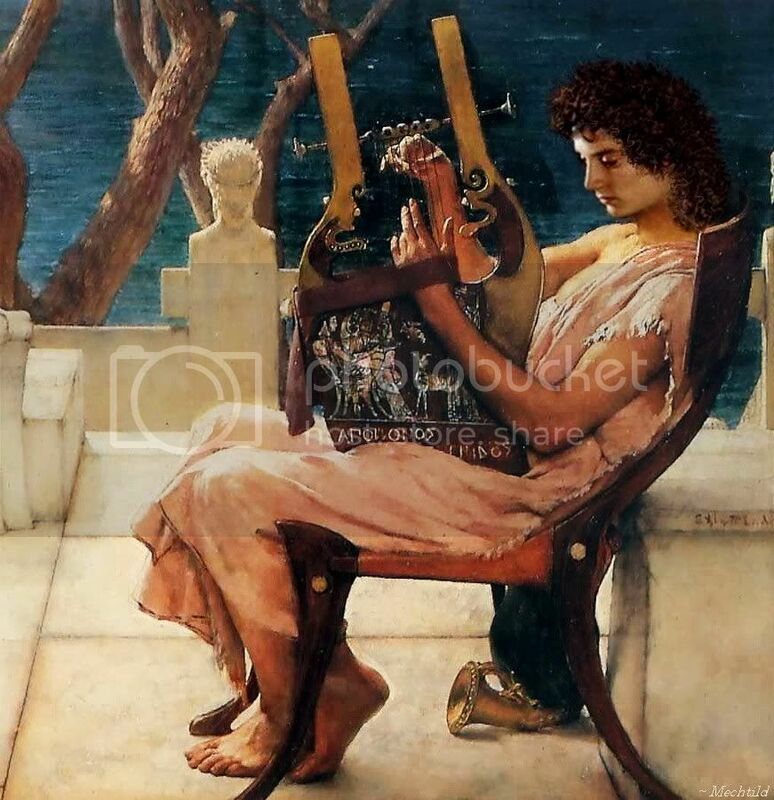 The young musician is named by Alma-Tadema, Alcaeus, who was a famed poet and musician (c.620-c.580 BC) (and a favourite of the actual Sappho of Lesbos whose name we have taken generically to mean High Priestess), so we can guess that the outcome in the painting will be that he will be granted the laurels. Beyond Sappho we see an audience representing the other people admitted to the temple. Two matrons are present because, as women, they share in the nature of the Great Goddess, while a young man is present [upper tier, with red hair] presumably because he has undergone the rites of Attis, which word is carved into the marble below his arm. Apart from that, I thought I’d mention that Sappho, apart from being famous for her superb, passionate, lyric poetry (much of it addressed to women she admired and/or loved), was reknowned for her unrequited love for a beautiful young man, Phaon. I’ll tell you a bit about that, since I think it goes well with any tale of the ravishing Frodo of Art Manip-Land. Phaon in Greek mythology was a boatman of Mitylene in Lesbos. He was old and ugly when Aphrodite came to his boat. She put on the guise of a crone. Phaon ferried her over to Asia Minor and accepted no payment for doing so. In return, she gave him a box of ointment. When he rubbed it on himself, he became young and beautiful. Many were captivated by his beauty. According to mythology, Sappho fell in love with him. He lay with her but soon grew to resent her and devalue her. Sappho was so disraught with his rejection that she threw herself into the sea to drown. Aelian says that Phaon was killed by a man whom he was cuckolding. Aside from Aelian, this Phaon's story is told by Ovid and Lucian. To give a flavour of what Sappho’s poetry to Phaon might have been like, below is a sonnet by Mary Robinson, a British poet and thinker of the late 18th century who wrote a cycle of sonnets (1796), based on Sappho’s life and her poetry. Here are two that particularly struck me, thinking of Art Manip-Frodo…. Himself conceal'd the crystal haunts among! And die, beneath the lustre of his eyes! And flow'rs, deep tinted with the rainbow's dyes! The rest of Mary Robinson's sonnet cycle based on Sappho and Phaon may be found HERE. "Mary Robinson is remembered both as the first public mistress of George IV, and as a woman writer of the late 18th century." Thank you, Mews. I was lucky to find this high-resolution image of the painting. I actually had made the manip two weeks ago from another copy of the image I had found on the internet, and I was perfectly pleased with it. I was too busy to write an LJ entry, so I just let it sit. But, only yesterday, I found a huge, beautiful, very high-resolution copy of the painting. It was so massively better, I made the manip all over again. But the difference was worth it. I am so glad I waited to post! If I had saved the first manip, I could have shown you the difference. It really was immense. Thanks for the background info, I find all this very interesting! He certainly is (more beautiful). 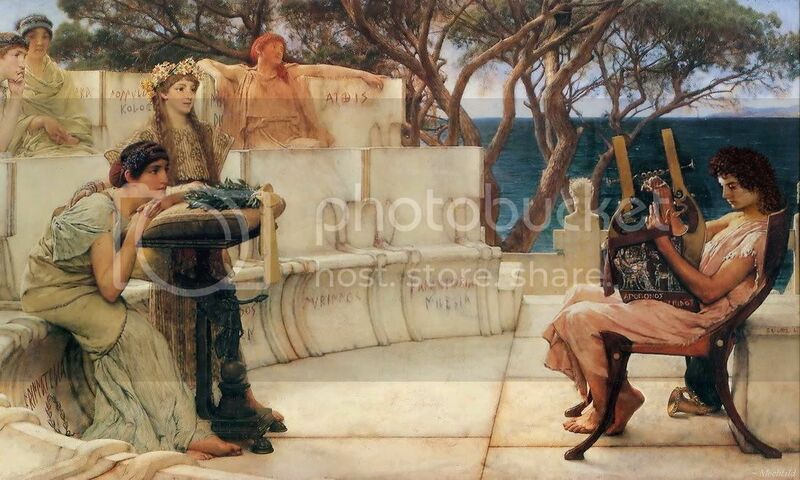 But so was Alma-Tadema's Alcaeus. I looked at a lot of his work, and he draws far more beautiful women than lovely young men. But, I fear that his women's looks have fallen out of fashion, while his men's looks have not. Hey, I see you have the Anthony Gayton "Endymion" for your icon. What a photograph that is! *slather* Thank goodness for Whiteling, or I never would have seen it. He's a huge improvement over the original, although I'm awfully fond of Girodet's very swoony painting (see icon). Oh look Mechtild, you made one of my dreams come true! Frodo on the Blessed Island playing for the Elves. What a wonderful classical Greek scene! And since Lili looks this Greek anyway he's just ideal for this painting, this style, time, everything! It made me sigh just to find your work. And in each case it made totally my morning! Thank you very much for sharing this beauty! Oh, thank you, Aredhelebenesse! That is high praise, coming from you, an artist and art fan. Yes, EW has classic beauty, all right. And I loved this setting. I am so thrilled I found the high-resolution copy of this painting. I had no idea just how exquisite it was until I did. The colours and the fineness and clarity of Alma-Tadema's brush work, after seeing it in other, lesser gallery websites, were a revelation. The Greeks would have loved him. As art and statues confirm! Doesn't he look stunning? Even the hands of the source model are really good. His feet? Didn't you know the Greeks were into shaving off their body hair? I'll bet the Elves were, too. Not that they had any. Maybe some comely Elf waxed Frodo's feet every now and then. So hot, all that instep fur, in the Mediterranean climate. Did you open the BIG version of it I linked? That's the one you should save, if you are going to do that. The resolution is just EXCELLENT. I have never read that Sappho loved men, either. In fact, I think this man was an exception. Because of his beauty. Sappho loved beauty so deeply, perhaps she made an exception for him. Lands learning to play a musical instrument. I am sure he would be invited to perform for them. What a lovely thing to imagine! And a beautiful manip. What a wonderful job you did! It is perfect! :) Thank you, you made me smile on a bad day! A bad day? Oh, no! Are you feeling very low? I hope it's nothing truly serious. Thanks all the more for stopping to comment, Frodosweetstuff. Frodo's melancholic face adds a whole new layer to the painting. The original Alma-Tadema musician looks concentrated too, but not so lugubrious as Frodo. I really seem to hear music while looking at that picture! The high-res version is wonderful; it's always fantastic to find paintings in such good quality, isn't it? I enjoyed reading your added info and the sonnets too. Ah, Whiteling! That clip! I've seen that ages ago, but forgot all about it. Wouldn't THAT be funny? Alcaeus on helium. Yes, that poem was full of appropriately Frodo-lust-attuned images. The one you chose; ah! Smitten with Cupid's dart! Yes, it is a thrill to find a really great copy of a painting. Truly, I don't think I've downloaded a painting with better quality. I was *stunned*. Well, you know I was if you read that I already had made this manip before I found the finer version of the painting, was amazed at the difference, and made the manip all over again. It was that superior. This is a feast for the eyes! Thank you Mechtild! LOL the comment on them waxing Frodo's feet. POOR FRODO! Can't see him putting up with that. I get the impression hobbits are very proud of their hirsute footies. You do make some lovely images. Thank you, Taerie. 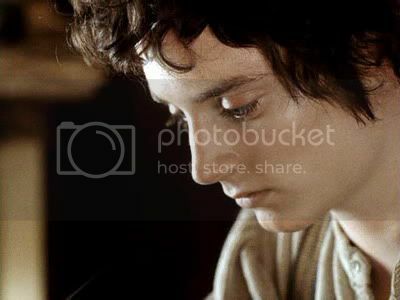 You won't have to brush up anything - except do whatever it is you are thinking of doing to your Frodo Reading picture, and get it posted in hobbit_art. Thanks so much for commenting, Bagma. Snort! Yes, the Prancing Pony was never like this. And Frodo's glad! Nice work once again, Mechtild! Thank you, Mariole. But you'll note that in Tol Eressea he is safely seated and not doing his turn on a table top. See? He is a smart lad, he can learn from experience. 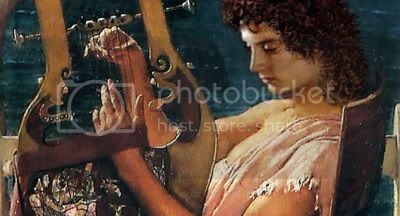 I wrote about Frodo playing and writing music on a lyre in my fic, Calypso. This Travesty illustrates the vision in my mind perfectly, although I didn't put in all those female admirers! I do admire your skill at these, they are always so beautifully done. I must have completely missed Calypso. Surely I would have remembered the title, as well as the image of Frodo playing the lyre! Mectild, you have excelled yourself. Both artistically and technically that is perfect. And those sonnets, particularly the first, fit so well. Do you mind if I save everything? Please do, Earth's Daughter, and welcome. I keep a link to my "Frodo Art Travesty" album, in case you are interested in seeing others, as well as links to tables of contents for everything else I make for LJ. They are over in the left hand column of the main page of every journal entry, under "Links". I am pleased when people want to save them to enjoy. I only ask that if you actually post one that you credit me, and, if possible, the painter of the original painting (or the sculptor or art photographer), since there could be no manip without their fine work. I always give the name of the artwork and its artist in the title of every image in the album (viewable when the images are opened).